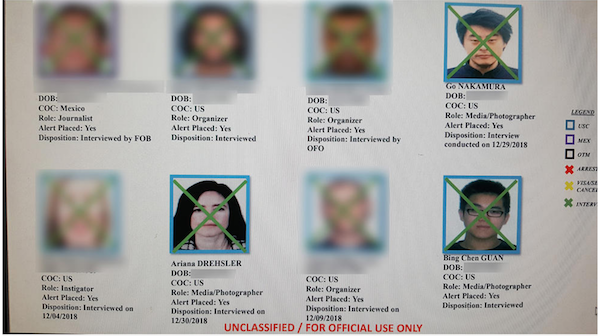 A Homeland Security source shared with NBC 7 Investigates documents from “Operation Secure Line,” an intelligence effort that targeted journalists and organizers affiliated with the migrant caravan. Source: NBC 7 Investigates. NBC 7 Investigates asks that you contact them if you are interested in finding out if you’re on the target list or sharing your story. (Previous coverage on targeting of journalists and activists from LA Times, Intercept, and NPR). The Office of Refugee Settlement has been cooperating with ICE to provide information about undocumented parents and relatives who sponsor unaccompanied minors, reports Reveal. ICE claims they are cracking down on human smuggling rings, but the details of the cases contradict this narrative. Instead, “the agency that’s supposed to be aiding children in the immigration system has helped ICE deport their parents,” write Laura C. Morel and Patrick Michels. Why are family members of detainees being told they need to use a travel agency in Georgia rather than pick up their kids personally or use gifted miles to fly them across the country? Texas Monthly reporter Katy Vine tried to unravel the mystery, but found nobody seems to know the answer. At least six families have been told that the only way to reunite with their children after they are released from detention is through a Georgia-based travel agency called Copacabana Travel Management, which charges above-market prices for airfare. Republican Senator Rand Paul announced this week that he would vote to reject Trump’s declaration of a national emergency, becoming the fourth and final Republican vote needed. Trump is expected to issue the first veto of his presidency, and it is unlikely that both houses of Congress have the two-thirds votes needed to overrule. In testimony before the House Homeland Security Committee, DHS Secretary Kirstjen Nielsen defended Trump’s declaration of a national emergency at the border. More than 70,000 migrants, mainly Central American parents with children, were detained by U.S. authorities in February, putting the year on course to mark the highest level of unauthorized immigration in a decade, reports The Washington Post. On Monday, more than 1,800 Central American parents and children crossed the border in a record for daily crossings of family units. The increase in unauthorized immigration has debilitated immigration agencies’ resources, reports The New York Times. Processing centers are full and authorities often fail to provide proper medical care. El Paso has seen the biggest increase of border apprehensions: a 434 percent increase this fiscal year, reports El Paso Times. A $192-million processing center will be built in El Paso to address the problem. Experts say the Trump administration’s attempts to restrict asylum have backfired and instead caused more migrants to cross illegally between ports of entry instead of turning themselves in at a port of entry, leading to the increase in border apprehensions, reports Houston Chronicle. Given that most of these migrants are seeking asylum, the influx must be addressed legislatively, and not with a wall, a DHS official told NPR. A group of 29 Central American parents who were separated from their children under the zero-tolerance policy returned to the border last weekend to request asylum in the hopes of reuniting with their children. After some questioning by immigration officials, all 29 families were allowed to enter the U.S., but they still await reunification with their children, reports NPR. Another Honduran mother has reunited with her 10-year-old son after being released from detention while she seeks asylum, showing the Trump administration’s return to the “catch and release” policy he has railed against, reports The Washington Post as part of a series by Michael E. Miller and Sebastián Hidalgo that followed the mother and son as they became separated and tried to reunite. A Mexican man on his deathbed in the U.S. asked a friend to find the wife and kids he had left behind in Mexico a decade ago, reports the LA Times. They were reunited just in time for the man to ask for forgiveness. Despite legal challenges to the “Remain in Mexico” program, which sends asylum seekers to Mexico to await the results of their cases, it has been expanded to include migrants who entered between official ports of entry, reports Vox. The program had previously focused on Tijuana but will soon include Ciudad Juárez, sparking criticism given the dangers and strained resources on the Mexican side of the border, reports Texas Monthly. The program is also going to start in other parts of California, Arizona, Texas and New Mexico, reports The Dallas Morning News. At least 15 police officers from El Salvador are seeking refugee status through the United Nations, and are even considering a caravan of their own, showing the dangers of policing in the country, reports The Washington Post. Gangs and police have been increasingly at odds in recent years as security forces in El Salvador have increased mano dura policies that have led to extrajudicial killings. The disparate experiences of three women from Guerrero, Mexico in the asylum system shows the inner workings of the U.S. immigration, reports Rebecca Plevin and Omar Ornelas for The Desert Sun in a series about Mexican migrants fleeing cartel violence. Another story in the series follows the indigenous communities in Mexico who are disproportionately affected by cartel violence, causing them to flee. For 18 years, undocumented Mexican immigrant Juan Quintero worked long hours tending two Trump properties, Trump National Golf Club Hudson Valley and a weekend hunting retreat called Leather Hill Preserve. Recently he was fired as part of a purge of undocumented workers, reports The Washington Post. Quintero’s experience shows the president’s reliance on undocumented workers extends beyond his golf courses. A New York Times investigation uncovered more than 100 cases of sexual assault of undocumented women along the U.S.-Mexico border in the past two decades. There are likely many more unreported cases, “suggesting that sexual violence has become an inescapable part of the collective migrant journey,” writes Manny Fernandez. In an extensively reported radio piece, Radio Ambulante’s Silvia Viñas hones in on one case involving a border patrol agent and two Guatemalan teens, to try and understand what this incident tells us about the largest security agency in the United States. A Border Patrol agent in Texas was arrested and charged with attempted homicide this week, reports KRGV. The agency says it is an isolated incident, but previous reports have detailed a pattern of abuse and violence by Border Patrol agents. The history of Border Patrol abuse goes back decades, reports The Guardian. The agency has always been “a frontline instrument of white supremacist power,” writes Greg Grandin. Immigration advocates filed a complaint against the federal government last week for violating the rights of at least nine infants held in detention centers, where they often lack proper medical care, reports BuzzFeed News. In response to the complaint, ICE released records of the infants in its care and revealed there were 17 infants in a detention center in Dilley, Texas, reports Pacific Standard. On Tuesday, ICE said all but one infant had been released to their mothers. Eighteen women miscarried while in ICE custody between October 2017 and August 2018, nearly double from roughly the same time period the year before, reports The Daily Beast. Lawmakers are calling for an investigation into policies that could be leading to this increase in miscarriages. A New York Times investigation revealed a systematic problem of a lack of proper medical care in CBP facilities, finding six adult deaths in the agency’s custody last fiscal year were not anomalies. Charity organizations often report receiving migrants from CBP who are in such a dire state that they need to go to the emergency room. For 13 years, USCIS has attempted to implement a digital system to replace the current paper system where files are often misplaced and lost, reports The Nation. The effort has been mismanaged and has lead to easily avoidable removal proceedings, which can lead to immigrants their lives. In Boston, the U.S. Department of Labor has filed a complaint against an employer who allegedly cooperated with ICE to detain a former employee in retaliation for the worker’s compensation claim, reports WBUR. In South Florida, lawyers allege that an undocumented immigrant who exposed injustice at a detention center in a documentary was apprehended without cause just weeks after the documentary aired, reports Miami Herald. He now faces immediate deportation. In New York, ICE has been keeping a spreadsheet of anti-Trump, anti-ICE, and pro-immigrant protests, reports The Nation. The agency said the list is meant to promote situational awareness for employees traveling through the area, but critics say the list sets a bad precedent of monitoring protest groups. Detention and deportation of immigrants with longstanding roots in the country have increased under the Trump administration. The outcome of these cases can often depend on the determination of lawyers to never give up reports The Intercept in a piece following two lawyers who have set up a “guerrilla habeas team” to fight deportations. State legislators in New Mexico are considering a bill that would limit the use of state funds for immigration enforcement purposes, including detention of migrants, reports AP. 300 percent increase in the number of immigrants deemed ineligible under the public charge rule. Ronny Rojas, a former data editor at Univision and current Knight Fellow, is investigating creating a network of investigative immigration reporters. He is asking journalists and editors to take his brief survey. The Center for Comparative Immigration Studies published a report this week documenting violations of migrants civil and human rights, including family separation and the hardening of interior enforcement policies.